Hello all and I hope that you're having a good week? The usual sort of busy one here, but feeling a bit grotty at the moment as seem to have a rotten ear infection - AGAIN! So yet more antibiotics (which I hate taking but nothing else will get rid of it!). Deaf in one ear and limited in the other - and being subjected to the usual jokes at home from husband and son (the usual ones along the lines of "Pardon?" every time I say anything, or moving lips pretending to talk! Not funny at the moment!). Sigh. So fingers crossed that it clears soon - I don't like feeling so unwell! The background paper is from K&Co and I've used a Poppystamps leaf die. The sentiment is from LOTV. 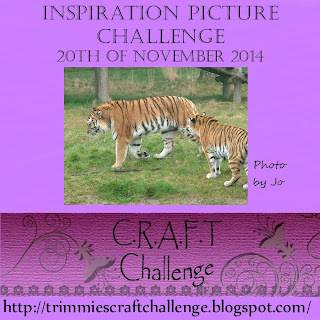 There is an inspiration picture challenge this week and I used the colours and patterns as my inspiration. Do pop over to the C.R.A.F.T. challenge and have a look at the great inspiration from the DT - and then join in with your crafty makes! She is so sweet Kim and beautifully coloured. Hope you ear infection clears up soon. Gorgeous card Kim, fabulous colouring and I love the papers. I hope your ear infections clears soon. This is so cute and coloured superbly Kim. Sorry you are poorly again, I hope you soon start feeling better. Fabulous image and colours,love your card Kim. Such a cute image and fab colouring Kim..love your card design and the bold bright colours..hope your ear heals soon, and I hate being the brunt of jokes that go on and on when you are feeling low..tell them to be nice or I may have to come over there and deal to them..lol...take care. Such a beautiful card! Love your colouring! So sorry to read you are unwell with another ear infection, hope you are feeling better soon. Gorgeous card Kim, love the image fabulous colouring. Hello Kim, A beautiful cute card, love the image and the colour choice. I hope you ear infection clears soon. Well, Kim, your illness has certainly not affected your creativity! This is a beautiful card. Look forward to more of your lovely creations and hope you are feeling better soon! What a great card! I Just love the colors!